Tim Willey is a recent graduate of the International Field Geosciences program. As part of his studies he worked with researchers at the German Research Centre for Geosciences (GFZ) in Potsdam. His work as an intern has been credited in a Geology article published late last year. Professor Joel Harper and students Rosie Leone, Aidan Stansberry and Ian MacDowell were joined by a reporter from PRI on a recent trip to the Greenland ice sheet. Their experience is documented in the linked article and podcast. Graduate Student Update from Laura Stevens: Are stromatolites always good biosignatures? With the support of UM BRIDGES, Geosciences Graduate Student Luke Fisher spends the summer working with The Nature Conservancy in Bogota, Colombia helping to integrate Geomorphic models into a decision support system framework for hydrologic issues in the Magdalena River Basin. University of Montana graduate student Isabellah von Trapp recently received an Outstanding Student Presentation Award at the annual meeting of the American Geophysical Union. 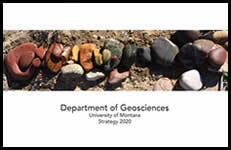 We are happy to announce that undergraduate students now have two ways to complete the lower division core for the Geosciences B.S. Degree or Minor. A new $1.54 million grant from the National Science Foundation will fund University of Montana geoscientists as they study the deep layer of compacted snow covering most of Greenland’s ice sheet.